Rattle and Hum was bound to sell extremely well. Released a year after the end of their Joshua Tree world tour alongside a documentary film of the same name expectations would have been incredibly high for any new music from the biggest band in the world. Perhaps following up your creative peak by releasing a compilation of tour recordings and new ‘classic rock’ style songs wasn’t the smartest move. Rattle & Hum is a very confusing listen from the start, with their declaration of reclaiming Helter Skelter from Charles Manson a very weird way to open a studio album. Another cover of Bob Dylan classic All Along The Watchtower makes a little more sense given the original collaborative song Love Rescue Me that follows it later in the tracklist. Most of the original songs here are perfectly fine, standout Desire deservedly giving the group one of their biggest hits to date, while the brass of Angel of Harlem sounds absolutely nothing like anything previously recorded by the band. Everything attempts to capture ‘classic blues rock’ while placing U2 as part that history, but there’s no unifying sound. Written and recorded during the tour, none of the original songs really come together as one album. This might be part of why the band thought to put everything in the context of these live performances, in a hope to bring Rattle and Hum together any way they could. Instead it feels all over the place and often achieves the opposite effect of removing the solid thematic tone that The Joshua Tree and The Unforgettable Fire manages to capture. In fact the best moments here are the live performances from the Joshua Tree Tour, the gospel version of I Still Haven’t Found What I’m Looking For and the tremendously huge sound of Bullet The Blue Sky both sound amazing. Because of this, I’d much rather just listen to the full Joshua Tree tour, which would eventually be released in full to mark the 20th anniversary of that album. 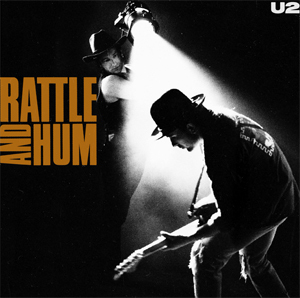 There’s some great music on Rattle and Hum, but as a studio album it just has no idea what it’s supposed to be. Will I listen again? : No, I would rather just listen to the rest of their great albums discography. Best Track: Desire would be my favourite of the new songs, but the clear highlight for me is the performance of Bullet The Blue Sky which is full of passion and electrifying sound from the band. Tags: Bullet The Blue Sky, Desire, Rattle and Hum, The World's Greatest Hits, U2. Bookmark the permalink.